The class includes a good physical warm-up, and exploration of different physical structures. Introduction of the tool, the structural model of human movement and the dynamic structures. Practical exploration: through different practical exercises and tasks we practice these tools and experiment, play and create movement sequences. 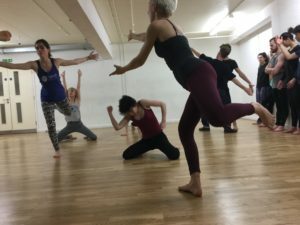 This class is ideal for actors who wish to develop their voices for flexibility, range, confidence, support and control. Using group exercises for physical and vocal dexterity; articulation; vowel-placement, relaxation and breath-support, pitch-awareness, dynamic range and resonance. We work in whole-group, small-group, pairs and individually; involving both spoken and pitched sound and harmonisation, and analysis of how sound is produced. The whole is designed to build confidence and range, and to be stimulating too. *DISCOUNT AVAILABLE! Take both Voice and Movement for a combined price of £400, a discount of £100!